High purity silicon parts, which have the same degree of purity as silicon wafers, generate almost no contamination and much fewer particles. 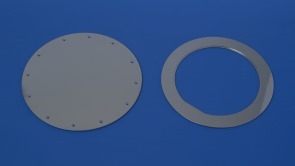 Although the standard product is made in a ring shape, it can also be produced as a rod or a plate, and the high precision machining that was once considered difficult when producing parts is now possible. There are great expectations for its application in various processes.